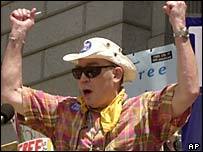 Hunter S Thompson, who has committed suicide aged 67, was an unflinching and acerbic chronicler of US counterculture. A leading political journalist, he was also considered one of the most important US authors of the 20th century. Known for his cutting and explosive writing style, Thompson's renegade reporter attitude was a revelation in 1960s America. His pioneering "gonzo" journalism - which throws objectivity out of the window and engages the writer's personal views - became his signature style. But it was the publication of Fear and Loathing in Las Vegas in 1972 that confirmed Thompson's cult status. At the time he claimed the drug-fuelled account of a weekend in the Nevada desert gambling hub was an accurate example of gonzo journalism. Thompson later admitted that some of the hedonistic events he described never took place, but his reputation as a wild-living, hard-drinking, LSD-crazed writer bent on self-destruction was sealed. Thompson was born Hunter Stockton Thompson on 18 July 1937, in the southern US state of Kentucky. His rebellious streak emerged at a young age and meant he often found himself on the wrong side of the law for drinking and vandalism. In 1956 he was enlisted in the US Air Force and was assigned as a sports writer for the air base newspaper at Eglin Air Proving Ground in Florida. But the rigours of military routine meant the young Thompson quickly became dissatisfied and he was honourably discharged after only a year. Stints as a sports reporter at various newspapers in Puerto Rico and South America followed, before he hit the big time in 1966 with his first book, Hell's Angels. It was the story of his infiltration of the then-feared Hell's Angels motorcycle gang - an experience during which he was savagely beaten. His other works include The Great Shark Hunt: Strange Tales from a Strange Time, The Curse of Lono and Fear and Loathing on the Campaign Trail '72 - a collection of articles he wrote for Rolling Stone magazine while covering the re-election campaign of then-president Richard Nixon. He wrote of Nixon that he represented "that dark, venal, and incurably violent side of the American character". More recent works by Thompson include The Kingdom of Fear: Loathsome Secrets of a Star-crossed Child in the Final Days of the American Century (2003) and Hey Rube: Blood Sport, the Bush Doctrine, and the Downward Spiral of Dumbness (2004). Thompson is survived by his second wife, Anita Beymunk, who he married two years ago, his son and a grandson.